My latest “In Good Faith” column reminds us that it’s okay to keep downing Peeps — the advantage of living into the 50-days of Eastertide. Fear not. For behold, I bring you tidings of great joy: Easter is not just a single day but a 50-day season of resurrection glory! Thus, you can keep the jelly bean sugar high going with reckless abandon. 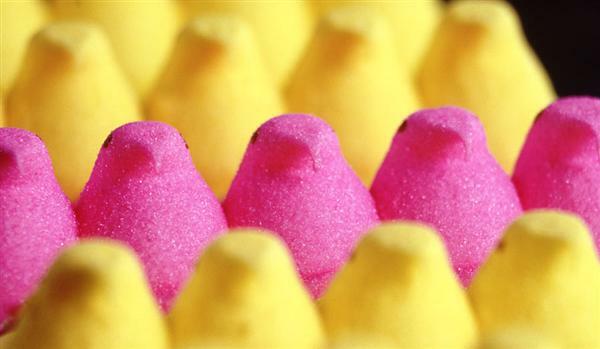 Grab those Peeps (which taste better when they’re slightly stale anyway). Finish the giant chocolate bunny you’ve already decapitated. Live into the joy without guilt. You can always start the diet the day after Pentecost (June 8th this year), the last day of the Easter season. The wise reader, or the one studying for the SATs, will make the connection between 50 and the pente root of Pentecost (think pentagon — five sided). Pentecost literally means fiftieth day in Greek. Etymology lesson aside, the Church has celebrated Easter as a 50-day season for generations. This tends to be forgotten in our Hallmark skip-ahead-to-the-next-holiday culture, but it’s important to take some time to bask in the warm glow of the resurrection. After all, it’s the seminal event in the Christian faith so what’s the rush? Plus, living in the Boston area, we could use that extra dose of joy. I was particularly struck this year that the Boston Marathon took place the day after Easter. To varying degrees we were all affected by last year’s tragedy and Patriots Day 2014 turned into one long day of regional catharsis, which we all needed. I ran the race in 2008 and at one level I couldn’t even imagine what last week’s event was like. The crowds, the emotion, the global news coverage were all unprecedented. But at another level, I knew exactly what it was like. Not because I once turned that corner onto Boylston Street and dragged myself the last four blocks to the finish line amid throngs of cheering spectators — I barely remember that. But because the 118th running of the Boston Marathon was a tangible sign of resurrection. Each footstep, each cheer allowed the finish line in Copley Square to be reclaimed as a place not of tragedy but of triumph. And as Christians will tell you, we know something about transformation and new life. On Easter, the cross is transformed from an implement of torture and death into an instrument of resurrection glory. Hope and meaning emerge out of chaos and we are transported into a new, life-giving relationship with God. But we also know something about death — faith doesn’t make us immune to the painful realities of life. We lose someone close to us and the pain can be searing; a relationship fractures and it leaves us reeling; we lose a job and we’re left seeking an identity; an institution we’ve always loved closes and it leaves a void; we feel betrayed by a friend and it stings. When we talk about resurrection, we first must confront death since you can’t share in resurrection joy without first experiencing grief. Indeed, the road to Easter goes straight through Good Friday. And yet Easter reminds us that despite the tragedies and trials we all face in this life, death doesn’t get the last word. We don’t remain on Heartbreak Hill; death doesn’t win. Life does. Because when Jesus emerges from that tomb life wins out over death and that false boundary between life and death is breached once and for all. That’s what the celebration is all about. As people who have come through a dark period in our collective civic lives, we have earned the right to extend the celebration. So grab a handful of jelly beans. If you’re like me you’ll want to avoid that horrid buttered popcorn-flavored Jelly Belly. But enjoy the rest of them. It’s okay to let the joy sink in for awhile.